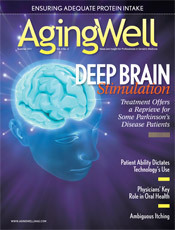 Deep brain stimulation can alter the abnormal function of the targeted brain structure in Parkinson’s patients. Parkinson’s disease (PD) is a debilitating degenerative disorder that begins slowly and worsens as the damage to brain cells continues, leaving patients with loss of muscle control, impaired gait, shaking, and stiffness. But thanks to deep brain stimulation (DBS), in which an electrical stimulation device is implanted in the brain and programmed remotely, more patients can control these symptoms for an improved quality of life. DBS is a technique that has been available for treating neurological disorders since the 1970s. According to Antonio De Salles, MD, PhD, a professor of neurosurgery and radiation oncology and head of the stereotactic surgery section at UCLA, DBS was initially widely used for treating refractory pain. Then it was used to abate pain of central origin, such as poststroke pain and other causes of damage to the central nervous system. Because of the remarkable results observed, experts tried DBS for treating PD where tremor is prevalent. “It was developed further for other symptoms of Parkinson’s disease, such as rigidity and bradykinesia, by implanting the electrode in other areas of the brain, such as the globus pallidus internum [GPI] and subthalamic nucleus [STN],” De Salles says. As Paul Larson, MD, an associate clinical professor of neurological surgery in the University of California, San Francisco department of neurological surgery and chief of neurosurgery service at the San Francisco VA Medical Center, explains, more than 70,000 patients worldwide have been implanted with DBS, which is indicated when patients have advanced in their disease to the point where at least one of two things has happened: The patient has developed motor fluctuations for which medications are no longer effective throughout the day and/or the patient has developed bothersome dyskinesias. According to Michael Okum, MD, national medical director for the National Parkinson Foundation and codirector of the Movement Disorders Center located within the McKnight Brain Institute and the University of Florida College of Medicine, many human central nervous system diseases are associated with abnormal patterns of physiologic activity in brain circuitry. As Okum explains, DBS devices can be appropriately placed in an operating room setting utilizing advanced brain imaging, stereotactic targeting, microelectrode recording, and macrostimulation. “The placement will often need to be within a millimeter or less of the optimal target to improve symptoms and avoid side effects,” Okum says. Following placement, the electrodes remain implanted and adjustments can be made to DBS settings (eg, pulse width, frequency, amplitude) for changes in symptoms over time. At its core, DBS is based on cardiac pacemaker technology with a combination battery and pulse generator unit placed under the skin in the chest and one or two stimulating wires that are placed into a part of the brain that coordinates body movements. These targets were previously sites where neurosurgeons performed minute lesions to improve movement disorder symptoms, De Salles says. Therefore, the most accepted theory of the mechanism of action of DBS is that the high-frequency electrical stimulation delivered by the device leads to inactivity of the tissue surrounding the implanted electrode, mimicking a lesion. This theory is debated and there is some evidence that depending on the target, other pathways beyond the site of stimulation are affected to improve symptoms. Initially the FDA approved DBS for chronic pain procedures. However, over the years this application became less prevalent, and the modern devices were not approved for this application. Now the FDA has approved DBS for essential tremor and PD as well as for other applications, including dystonia and obsessive-compulsive disorders. Other applications, such as for epilepsy and depression, are close to approval while more exotic applications, such as for morbid obesity, Alzheimer’s disease, and tinnitus, are under investigation. Essential tremor patients become candidates when their quality of life is hampered by the intensity of their tremors to the point that they cannot care for themselves and subsequently experience social impairment. The same is true for dystonia and obsessive-compulsive disorder patients. Patients must be fit for surgery as far as cardiac reserve and mental status and be capable of collaborating with physicians to monitor their therapy. De Salles stresses that the risks of DBS include intracranial bleeding, paralysis, and death. “These are the risks of any major surgery in the brain; however, DBS is considered a minor surgery in the realm of neurosurgery,” De Salles says. The risks of devastating complications runs less than 0.5%, while minor complications such as infection and hardware breakage have been reported in between 1% and 13% of cases. The benefits include the reversibility of the procedure and the major improvement of symptoms when properly indicated. Other risks include failing to place the electrode in the best possible location, the breaking or malfunctioning of the system, and symptoms failing to improve as much as expected. Recovery from surgery is fast, requiring only a few days. “[Typically] one day admitted to the hospital is expected; discharge is followed by one week of complete recovery; and a second surgery within two to three weeks for implant of the pulse generator in the chest wall with connection to the intracranial electrodes,” De Salles says. “This generator will deliver the electricity to the brain. Following the generator implant, the patient undergoes several programming sessions where the physician adjusts the device to the patient symptoms and medication intake.” Patients should be followed at six-month intervals and usually will need a generator (battery) change approximately every four years. Physicians referring a patient for DBS should be aware of the need to program the device and, as with any electronic device, the patient can expect the need for proper maintenance. De Salles says physicians should advise patients of the possibility of the complications previously mentioned. Patients should also be made aware that regarding medications, the DBS therapy will need to be followed and adjusted when necessary. “The disease’s progress and the stimulation should be adjusted accordingly,” De Salles says. “DBS is not a cure for any disease; it is just a measure to improve the patients’ tolerance to the diseases’ symptoms, controlling and managing the symptoms, many times also needing medication to add to the effects of the DBS.” Physical therapy may be necessary for patients who have been inactive for many years before undergoing DBS surgery, as DBS surgery is capable of restoring patients to normal activities. Patients see dramatic, life-transforming changes after the deep brain stimulation (DBS). Some patients liken the transformation to a switch that turns off the tremors. DBS can be a game-changer for Parkinson’s disease (PD) patients. Up to 5% of the general population is affected by essential tremors and about one in 1,000 have PD, a number that increases to one in 100 for those over the age of 60. Movement disorders such as PD and essential tremors are more common than many people think, says Kelvin Chou, MD, codirector of the Surgical Therapies Improving Movement (STIM) program and an associate professor in the University of Michigan’s neurology department. Tremors from PD do not usually affect patients’ activities except in severe cases. However, many people are embarrassed by uncontrollable movement and don’t go out to restaurants or socialize. Medications can be effective for about 70% of patients with essential tremor and can work well for those with PD. But for many PD patients, the symptoms begin to worsen or don’t respond as well to medication over time. “When that starts to happen, when a Parkinson’s patient is forced to take medications every couple of hours just to keep themselves going or if medications don’t help an essential tremor, that’s when deep brain stimulation may be an option,” Chou says. “Not only do we have the anecdotal evidence of patients telling us that their lives have been changed, there have been careful studies comparing deep brain stimulation to using medication alone,” says Parag Patil, MD, PhD, codirector of the STIM program and an assistant professor of neurosurgery. Patil says there’s a team of experts at the University of Michigan who spend a lot of time assessing whether a patient is a good candidate for deep brain stimulation. That multidisciplinary team includes a neurosurgeon, neurologist, speech pathologist, and social worker. In addition, there is a neuropsychologist, who specializes in understanding thinking patterns associated with neurologic diseases. Patients also have access to physical therapists and psychiatrists. When the university started its program five years ago, about four or five patients were treated with deep brain stimulation each year. That’s now up to about 30 patients each year, and Patil says there are many people in Michigan and all over the world who could benefit from the surgery.